ACCORDING to Heat and Control Pty Ltd , there is no easier or more efficient fryer system than the Indirect-Heated Fryer system. It provides precise temperature control and low oil volume to deliver consistent product quality and low operating costs. 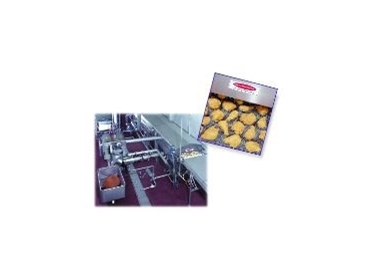 Indirect-Heated Fryer Systems allow the frying of a range of products such as: nuggets, bone-in chicken, patties, tempura shrimp, breast fillets, meat balls, egg rolls and coated vegetables. Production capacity and product heat load exactly match any requirements. The fryer and heat exchanger are sized individually eliminating the need to buy a bigger fryer than necessary to suit heat load needs. The entire fryer system requires 25-40% lower oil volume than comparable direct heated systems. With no heat transfer fins immersed in the pan, the fryer employs only enough oil to cover your product. Less oil promotes faster turnover and optimal product shelf life. Responsive indirect heating keeps the frying temperature within 1-2ºF of the set point for most applications. Product quality is consistent because load changes do not produce oil temperature lag or overshoot problems. 100% of the fryer system oil volume circulates through a filter on average of once a minute. This full-flow oil circulation makes fines easier to remove, greatly minimising oil degradation. Gentle-Flow oil inlets eliminate localised high velocity oil flow. Oil velocity matches product velocity to maintain product orientation and coating integrity. Oil flow and temperature are uniform across the full width of the fryer pan. Multiple oil inlets and outlets deliver precise, multi-zone temperature control along the length of the fryer pan for a consistently uniform product. The user can select the continuous filter system designed for their products, using: mesh, drum, paper, metal belt or centrifugal filter systems. External heat exchangers are available for natural gas, fuel oil, steam or thermal fluid. Rapid circulation eliminates hot spots and fines accumulations. To reduce installation costs, modular fryer support systems are available including all filtering, heating, storage and transfer equipment pre-piped and wired to single-point utility connections.